On Thu., Feb. 17, makinghistory.upenn.eduI had the opportunity to attend the dinner/dialogue on Power Up Gambia, featuring La Salle alum/current UPenn med student Jennifer Abraczinkas. Abraczinkas came back to her alma mater to give a small crowd of faculty and students the inside scoop on how the grassroots organization was started, her involvement, and how it continues to improve lives today. She also discussed her personal involvement, and why she felt inclined to help. She grew up in a small town in Pennsylvania that received its water from electrical water pumps. She confessed to taking easily accessible potable water for granted. She described a La Salle service trip to Mwanza, Tanzania, during which she couldn’t receive water for an entire day because the level of Lake Victoria was down. When she heard about what PUG was capable of, she couldn’t wait to get involved. She addressed how PUG has expanded: It's brought solar panels to the Somita Clinic, a community-built center maintained by volunteers. Most recently, the organization is working with Bansang Hospital, a facility that serves 600,000. As PUG continues to provide energy to more people, Jennifer hopes their actions set an example for other countries. 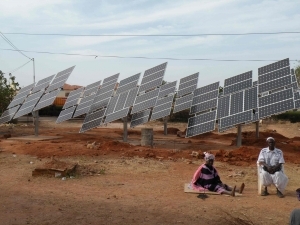 Since the sun is always heating up Western Africa, solar panels were a no-brainer. Though expensive, the panels PUG installed are expected to last about 25 years. Conservation training and maintenance teams make sure everything functions as it should. Another idea Abraczinkas mentioned is solar suitcases—portable, and ideal for trekking to clinics. (How cool!) PUG is definitely doing its part to spread the sustainable approach, and in doing so, it is saving lives.